Today I’ve been part of something quite exciting – the first meeting between Virtual Reality (VR) enthusiasts in both Shanghai and Brisbane, and indeed the entire world. How is that possible? And how did I do this from the comfort of my lounge chair? It’s called VRChat. 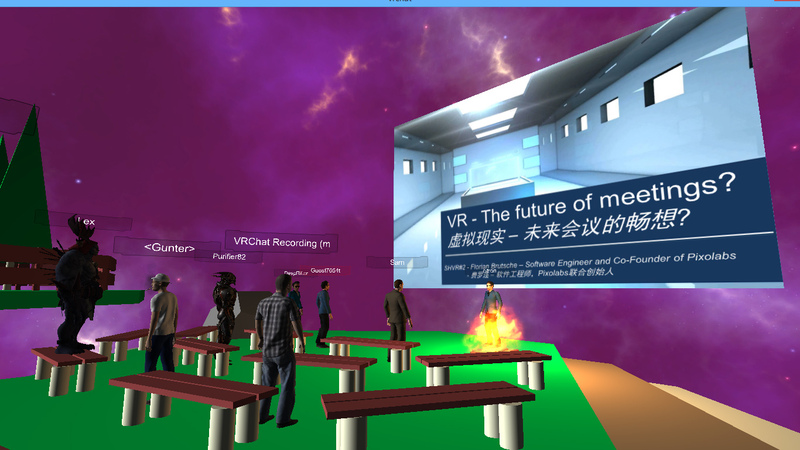 Basically the live event in Shanghai, attended by around 400 people, was simultaneously broadcast into a virtual meeting space (complete with camp fire and rocket ship!) into which anyone could participate. You don’t even need a VR headset, just a computer will do. Is this the future of Skype and other online communication tools? Essentially you could meet and collaborate with people anywhere in the world within a virtual setting of your choice. Why not plan your project from on top of the Empire State Building? Or catch up with friends and family on a virtual Eiffel Tower? While it’s early days, you can’t help but wonder about the possibilities. You can find out more about the partnership between the Brisbane and Shanghai VR groups, and the projects they’re collaborating on, through this article (click here). 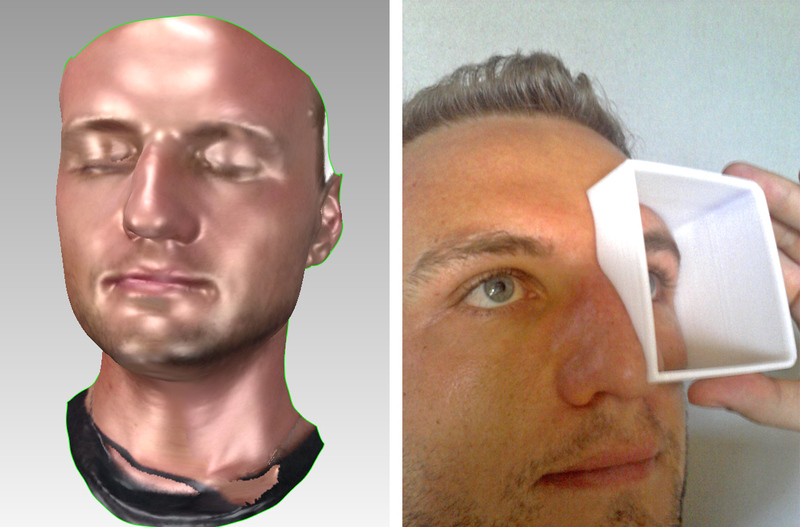 I will have some of my 3D printed headsets (check out the last one made from a 3D scan of my face) at the next Brisbane event on March 28. Visit the group’s website to find out more. Following on from my previous work building the Google Cardboard and my own custom virtual reality (VR) headset, the logical next step was to try 3D printing a full headset. With limited time before an upcoming talk I’m giving on Virtual Reality and 3D printing, I have downloaded the OpenDive model freely available on Thingiverse. I chose this one because I was impressed with the lens holders (which I already used for my Hybrid Headset) and it seems to have the most feedback/reviews/likes out of all VR headsets on Thingiverse. The most important point with this model is that I had to scale all parts down by 5% in order to fit the small print plate of my Up! Plus 2 3D printer. This was specifically for the main frame of the headset. I also had to use MeshLab to separate the other parts, as they are all grouped as a single STL file which also doesn’t fit the print plate. Interestingly the seemingly thick sections of material which I was concerned about have already been given an infill pattern within the STL file, minimising material waste which was good to see. I think the Lens Holders are too tight fitting within this model, while the brackets for the phone (printed in green) feel too loose – I’d probably want to glue these into place before risking my phone in there! Below you can see a time-lapse of printing the main headset – overall the complete model took just over 6 hours to print using the 0.2mm layer thickness and normal print speed. Yesterday I completed the Google Cardboard Virtual Reality (VR) headset and mentioned I was planning to try a simplified hybrid version that would incorporate 3D printed components. Well here it is after a morning of cutting and printing! One of the problems I had with cutting the original Google Carboard was the difficulty (and pain!) cutting all those small details, slots and holes by hand, eventually using a Dremel to carve out the eye holes (check out my original by clicking here). I have also been looking through the designs on Thingiverse to 3D print, however can’t find a design that seems properly thought through and doesn’t include unnecessarily chunky sections of material that seems wasteful (yes just another bit of motivation to get onto designing my own). However the adjustable arms many designs feature seems useful to optimise user experience for individual eye width, focus etc, and to improve visibility of the phone screen. I have downloaded and 3D printed just the arms from the OpenDive Headset, which perfectly fits the 25mm lenses I bought on Ebay. Something else I’ve realised through printing is that if I were to 3D print the full headset, it wouldn’t fit onto the small print plate of my Up! Plus 2 3D printer with it’s 140mm maximum dimension. I would either have to slice the model in half and glue together after printing, or print on a larger printer (which reminds me I have still not heard anything about when my Solidoodle Press will arrive, and has the larger print size I would need! Check out my little rant by clicking here). I have also significantly simplified the design of the Google Cardboard template to suit the thick cardboard I’m using and 3D printed adjustable lens holders as shown in the images above. This new design was significantly quicker to cut! Overall the completed design is nice and easy to make, provided you have a 3D printer on hand. I’m getting a much clearer view of the phone without anything obstructing the lenses, however it takes a few minutes to get the positioning of the arms correct for your eyes. If you look closely at the top images you’ll see I used a sharpie to mark a line on both the cardboard and the lens holders where the optimal position is for my eyes. Like last time I’ve also used a small bolt to hold it all together, and used my 3D printed ‘edditive’ logo to stamp onto the cardboard (which you can read more about here). 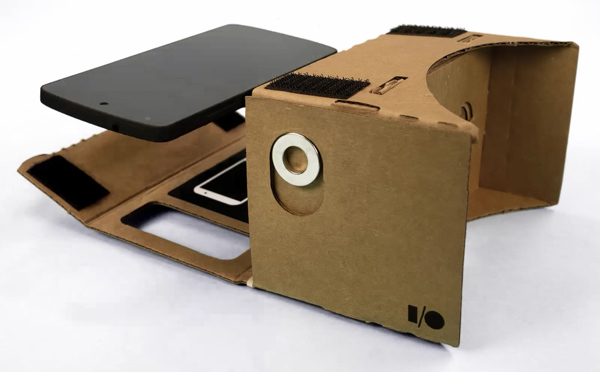 As discussed in yesterday’s post, I’ve been struggling to carve through some very dense 3mm thick cardboard to build my own Google Cardboard Virtual Reality (VR) headset. I did eventually use the Dremel to cut the details for the eye holes, there’s just no way I could cleanly cut them using a knife. Straight lines are one thing, but small circles are a whole different league! So my biggest piece of advice is to use the fluted cardboard recommended by Google, or use a Laser Cutter 😉 The only upside is that this headset feels very strong and durable, so I’m not at all worried about my phone falling out. Some of the slots also required modification once I started to fold everything up due to the extra thickness of the cardboard. But otherwise it came together really well. I used a small bolt to hold it all together on 1 side rather than gluing so that it can easily be taken apart. And just as a final touch I used my 3D printed ‘edditive’ logo as a stamp (read a previous post about 3D printing a stamp by clicking here). So far I’ve only watched a couple of short demo videos on Youtube using the glasses (The Matrix, 3D Canyon Coaster) but what a ride! Although I think it’s time for a new phone, I’m still using a Samsung Galaxy SII and with virtual reality you really need a much higher resolution screen – mine is extremely pixelated once you get those lenses on! Finding time to get to this little (well at least I thought it would be little!) project to build the Google Cardboard Virtual Reality (VR) headset has been a struggle over the Xmas and New Year period. I originally found inspiration after playing with the Oculus Rift at a VR meeting (click here to read my original post). My big mistake has been in using a very thick, solid cardboard (often called ‘boxboard’ used for architectural models) since it’s what I had lying around. It’s an absolute nightmare to cut all the details through about 3mm of card! The only upside is that the pieces I have completed are very rigid, so I don’t feel worried about putting my phone in there. The photos above show the process of printing the templates from Google (image 1), cutting them out (image 2), and then tracing and cutting these from cardboard (image 3). I really only have the eye holes left to go, and think I might try using a dremel to get these right. With a knife I fear they will just end up severely hacked! Since I’ve been asked to give a talk about the opportunities and limitations of 3D printing and virtual reality, I might also try some of the freely available 3D printable headsets for comparison. I bought 2 sets of 25x45mm lenses from Ebay, so can try a few different things. 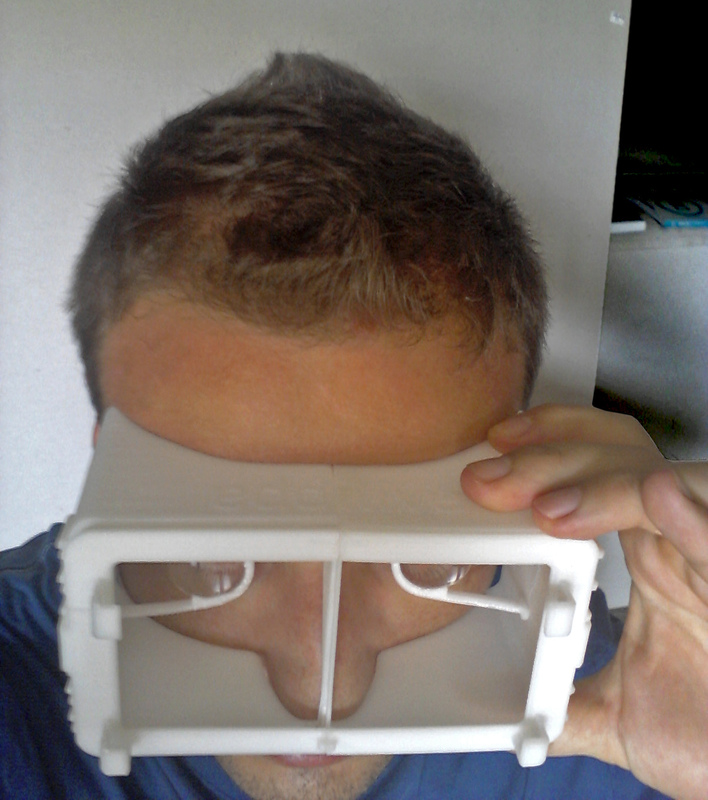 Stay tuned for the completed Google Cardboard and 3D printed headsets over the coming days. If I can find time, I’d love to design and print my own, there’s not much out there at the moment. Last night I attended the first Virtual Reality (VR) meetup in Brisbane, rounding out what has been an extremely nerdy week for me! But what an inspirational couple of hours trialing the Oculus Rift (awesome hover board game paired with a Wii Balance Board) and the soon to be released Samsung Gear VR. My interest is definitely coming from the angle of a designer, and what possibilities there may be to improve both the design of a 3D product within a VR environment, and then sharing this with a client or student. The digital revolution encompasses almost every possible industry from business and law to design and technology, and VR seems like another area similar to 3D printing that is growing exponentially across all these disciplines. So, on a high (or maybe just still dizzy from the hover board!) I’ve taken a tiny little step into this world by purchasing some lenses so I can make my own Google Cardboard device that pairs with my phone (lenses cost $3.75 on Ebay, the cardboard and other bits I already have lying around). Sure it’s not perfect, but there’s nothing wrong with baby steps! And the idea of ‘making’ my own hardware is definitely interesting as I sit next to a 3D printer…. So many ideas!! !